It's been another rollicking year here at Reds HQ. Laugh your way down memory lane with us as we chronicle the dumbest moments of 2018. It’s been another rollicking year here at Reds HQ, what with the creeping bedbug invasion at the courthouse, a proposed ban on offensive outhouses (is there another kind? ), not to mention Joe Trillo’s very bad day at the beach. Ultimately, though, one candidate soared above the rest as worthiest of this year’s dedication: Johnston’s elusive wild turkey. The fugitive fowl, you may recall, caused motorist mayhem for weeks, sashaying up the middle of Hartford Avenue, terrorizing the mayor’s assistant, looming in city hall windows and visiting Popeye’s chicken. Months later he’s still avoiding capture, most recently following a failed abduction with a malfunctioning CO2-powered net gun. Aside from a brief Thanksgiving day appearance (really) at Brewed Awakenings, there haven’t been recent sightings, so we figure he’s decamped to the same sunny destination many Rhode Islanders enjoy this time of year: Florida. Happy skies, Tom, we’ll see you in the spring! A loose steel plate sticking up on an I-95 construction site damaged eighteen cars, mostly causing flat tires. A family had to drive to the fire department to alert them that their garage was in flames. Speaker Nick Mattiello was ordered to repay $72,000 to a PAC that he controlled after it spent far more on his behalf than the law allowed. A fight broke out at a fitness club when two clients got into a dispute over use of the TV remote. Police arrested a man who stole $338 worth of condoms from the CVS on Newport Ave.
Police arrested a Warwick man suspected in numerous car break-ins after he used a Dunkin’ Donuts card stolen from one of the vehicles. Courtesy of Flo’s Clam Shack. Perhaps he was looking for love in all the wrong places. South Kingstown police alerted residents that a bear was roaming around near Old Mountain Field. Bird brain division, part one. A family of three newly hatched baby piping plovers and their parents made it safely to the beach after Narragansett officials were forced to close off fifty parking spaces to provide a buffer around the nest. Bird brain division, part two. A controversial crane sunk in Providence harbor and, under order to move, had languished in the muck so long, an osprey took up residence and built a nest. Exterminators were summoned to the Garrahy courthouse after multiple complaints that bedbugs were crawling on benches, biting people and laying eggs on someone’s shoe. They’re gonna need a bigger toothbrush. 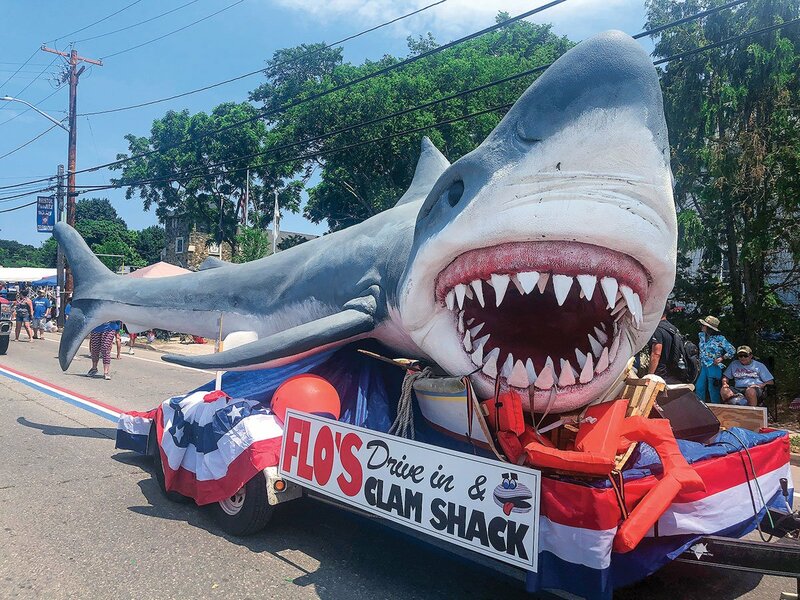 Club Mardi Gras’s twenty-five-foot fiberglass shark, put up for sale on Facebook for $1,000, was hooked by Flo’s Clam Shack and renamed Bruce. Warwick official Steven Gothberg after a sewer authority contractor mistakenly yanked out forty-three oak trees from behind John Brown Francis school, leaving stumps, wood chips and sawdust. The three-hour tour, an only in Rhode Island moment and other campaign highlights. 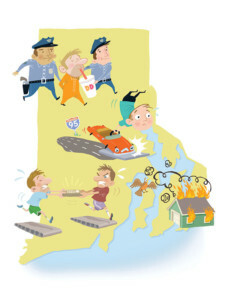 July 10, 2018: Witnesses dispute Trillo’s version of the mishap, saying the yacht was playing loud music, displaying a large Trillo for Governor banner, and hit rocks close to the beach. October 12, 2018: A forty-year-old police report describing Trillo popping twelve-year-old Nick Mattiello during a neighborhood altercation comes to light. Mattiello brushes it off, calling Joe a friend. Trillo also admits getting into a nose-tweaking scene with another former rep over legislation concerning boat toilet inspections. October 13, 2018: The feds confirm there have been no requests to add rocks to maps where the Lady M ran aground. November 5, 2018: Trillo posts on Facebook that an internal poll shows him at 33 percent of likely voters. November 6, 2018: Election day, Trillo comes in a very distant third in the gubernatorial race, polling a measly 4.4 percent of the vote. Former senator Lincoln Chafee on why he decided not to challenge Sheldon Whitehouse for the Senate seat in 2018. 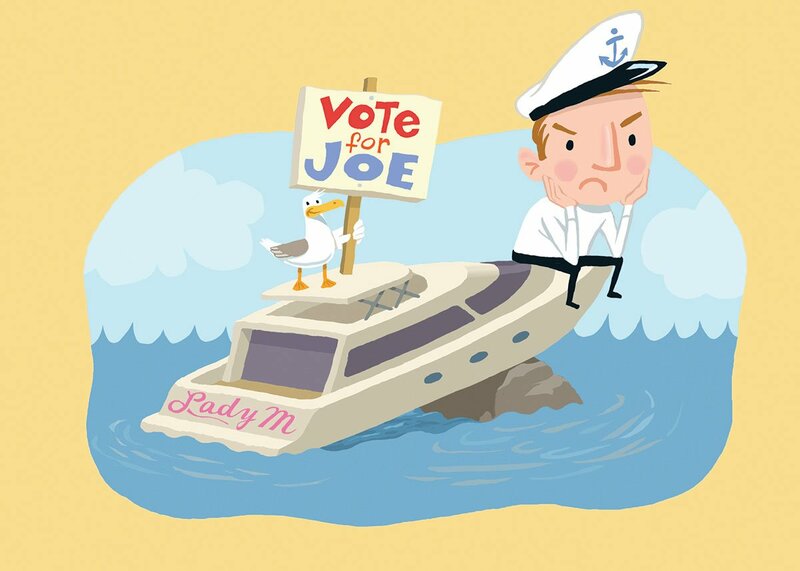 Chafee had been polling 58 points behind Whitehouse. True Crime Blotter could we make this stuff up? True! A Westerly man called police from the back of a cruiser to complain about the officer who was, at that very moment, giving him a ride home. Police chief Richard Silva says the man was intoxicated; he was charged with making a false 911 call. True! Newport resident and company exec Michael Lynch was sentenced to thirty-three months in prison for fraud and tax evasion after submitting more than $1.7 million dollars in phony invoices to his employer, Dr. Pepper. True! A thirty-six-year-old Providence man was charged with stealing an ambulance from Rhode Island Hospital and driving it to Connecticut. True! A man snatched a Cranston police officer’s $250 sunglasses from a table at a funeral home while the officer was paying his respects. True! Police were called to Dave’s Marketplace in East Greenwich after an employee saw a man stuff a pound of dough up his shirt, pick eggs out of the salad bar with his bare hands and eat pot stickers from the hot bar. True! A Newport police officer shut down a kid’s lemonade stand on the Cliff Walk, citing an ordinance violation. True! Two East Providence sisters were fined $1,050 each and ordered to do twenty-five hours of community service after pleading no contest to spray painting part of the Cliff Walk. Multiple callers ID’ed the twenty-two-year-old twins to police after recognizing them from the selfies they posted on Facebook. True! Police arrested a Portsmouth man and officiant at a Newport wedding after he stole a guest’s purse and used her credit card at a local pharmacy. True! An order for the arrest of gubernatorial GOP candidate Giovanni Feroce was canceled after he made a payment on an $8,000 judgment. The year-old court order was connected to a debt Feroce owed Broder Brothers, a clothing supplier.